The first independent money transfer service provider, and arguably the most well known, is Western Union. Founded in 1851, Western Union has dominated the money transfer space for over a century. Headquartered in Englewood, Colorado, Western Union prides itself in its established place amongst money transfer providers. Though remittance provider Western Union is considered to be a bank challenger, in many ways its operational structure is closer to that of the big banks than some of the smaller, but still threatening challengers, such as Azimo or Transferwise. Despite their original history as trailblazers, by 2015, Western Union had begun to lag behind more modern international money service start-ups. Even with this delay in technology, Western Union still retained some edge over more tech savvy companies by providing over 130 different currencies to its customers, more than double the amount that many of its competitors can provide. Still, Western Union’s slow adoption of modern technology began to become increasingly evident. 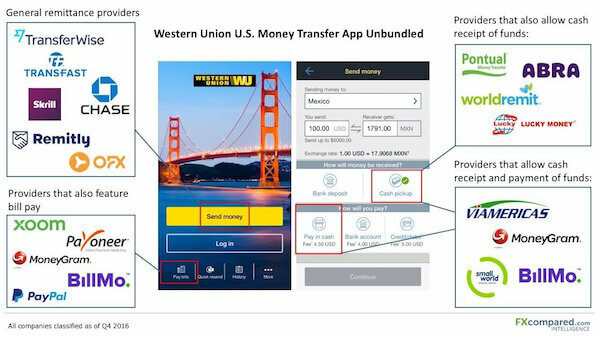 Western Union’s first international money transfer mobile application was not introduced until October of 2015, years after some of their biggest competitors. However, in the past two years since the release of their mobile application, we have seen more effort by Western Union to compete with the fintech challengers popping up on the scene. This is perhaps most evident with the updates of their mobile application. What was originally a simple app has evolved to compete the more developed technology of fintech challengers. The research team at FXC Intelligence decided to place a magnifying glass against the Western Union mobile app and see how it stacks up against competitors. In the chart below, you can see Western Union in comparison to other apps. Western Union’s application shows their dedication to staying on top of the money transfer industry – it’s clear the company recognizes that their longevity and brand recognition doesn’t preclude them from developing their technology. One of Western Union’s greatest edges is also perhaps its most old fashioned attribute. The ability to send money to live tellers ensures that Western Union can still have a large part of the unbanked market. Whether this advantage will continue for Western Union remains to be seen. Some of the newer money transfer challengers have been quick to embrace unbanked customers, with newer companies such as Abra and BillMo understanding that the live teller is still critical to customer acquisition. BillMo CEO Steve LaBella sees a great market in the unbanked of Mexico, and BillMo’s app focuses specifically on customers who may have a mobile phone but no bank account. You can read more about BillMo’s unique business model and how its development was partly influenced by the unbanked demographic here. Abra CEO Bill Barhydt discussed the importance of the live teller for customer acquisition recently in an interview with our intelligence division – which you can read here. As the remittance world continues to evolve in tandem with globalisation, we can expect to see more adaption by both established players such as Western Union and newcomers alike.